We women are notoriously bad at letting people know what we know and how well we know it. We rarely shout out about our skills and attributes. Nature, nurture? I don’t really know but suspect it’s the former combined with growing up in a world where men hold most of the power and the norms for ‘good’ are male. To my surprise I recently experienced this confidence phenomenon myself. 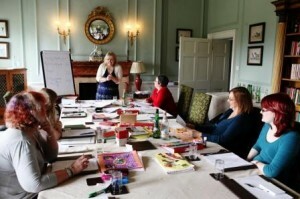 I’ve recently launched a new project to licence one of my courses, RenewYou and to allow experienced trainers to run it. I’ve been through quite a gamut of emotions while preparing the manual for other trainers to use. And yes, I confess, I found myself thinking: is this good enough- subtext, am I good enough? Will these very experienced trainers think it’s worth it? I definitely had a tiny confidence wobble which surprised me because I have had nothing but positive evaluations and comments about this course, and generally I am very confident in my work. So I had to give myself a good talking to. As I wrote the manual, I consciously tried to recall what was it I did to make women feel relaxed, to boost their confidence, to help them achieve their dreams. Most of the time I’m not even consciously aware of how or what I do so this was an illuminating lesson. I know loads! And I know ‘loads’ because I’ve had masses of experience in a lot of different situations and masses of excellent training and development. Having to write it down was a very good experience and one I recommend to you. What do you do that works well and how do you do it? The one rule is that you are not allowed to give the credit away. It’s about what you have done, not your team, or when you were ‘lucky’. Just you and your talents. And if you’re feeling a bit diffident about starting, remember, men have little trouble doing this and if we women don’t get it together enough to sing our own praises we’ll stay below the radar for much longer. Oh and my course? Well, let me tell you, it’s bloomin’ wonderful! And it’s mine! Actually, it can be yours if you’re an experienced personal development trainer, as you can see here. Yes, I agree that happens a lot. We tend to be shy about our accomplishments. We always compare ourselves to others and provide everyone else with sparkling reviews. Even when we do acknowledge our skills sometimes persons feel we brag too much. Then the negative criticism comes into play from other men and women. Confidence is very important so we need to learn how to show it. Yes, it’s especially important to teach our young girls it’s not showing off to be aware of your worth. Thanks Tamara.